OBJECTIVE: A tenet of motion palpation theory is the ability to confirm postadjustive segmental end-feel improvement (EFI). Only one previous trial has evaluated the responsiveness of EFI; this was a study of the thoracic spine. The purpose of this study was to evaluate the responsiveness of postadjustive end-feel for evaluating improvement in putative segmental spinal motion restriction after spinal manipulative therapy (SMT) of the cervical spine. METHODS: A prospective, blinded, randomized placebo-controlled pilot trial was conducted with 20 symptomatic and 10 asymptomatic participants recruited from a chiropractic teaching clinic. The treatment group received SMT, and the control group received placebo detuned ultrasound. Responsiveness was evaluated as the etiologic fraction (% of cases with EFI attributable to SMT) and as the sensitivity and specificity of change. RESULTS: For the entire sample, the etiologic fraction was 63% (P = .002), sensitivity was 93%, and specificity was 67%. For symptomatic participants, a strong relationship appeared to exist between receiving SMT and EFI (etiologic fraction = 78%, P = .006; sensitivity = 90%; specificity = 80%). A strong relationship was not found for asymptomatic participants (etiologic fraction = 40%, P = .444; sensitivity = 100%; specificity = 40%), where EFI was recorded frequently, whether participants received SMT or detuned ultrasound. CONCLUSION: The findings of this study showed that motion palpation of end-feel assessment appears to be a responsive postmanipulation assessment tool in the cervical spine for determining whether perceived motion restriction found before treatment improves after SMT. This observation may be limited to symptomatic participants. Because palpation plays a major functional role in the chiropractic approach to patient management, it is imperative that palpation be investigated further in a scientifically appropriate manner. Panzer  reported that palpatory findings were not used to monitor spinal changes during clinical trials and suggested that motion palpation be applied to clinical decision making and also to monitoring clinical change. (d) that this restoration of motion within the joint is palpable. In this study, we define “end-feel improvement” (EFI) as immediate end-feel restoration of the most “fixed” cervical motion segment immediately after SMT. Previous motion palpation research has primarily focused on interexaminer and intraexaminer reliability, with varying results. However, in addressing Faye's theory,10 it is imperative to establish whether motion palpation is responsive as a postadjustive assessment tool, allowing one to determine these restorative changes within the joint after treatment. In an assessor-blind randomized trial, Haas et al  assessed the short-term response (ie, perceived change) of manual end-feel to spinal manipulation in the thoracic spine. Two examiners evaluated on 60 students, of whom 60% were symptomatic and 40% were asymptomatic. The sensitivity of motion palpation to clinical change in terms of end-feel was investigated. The treatment group received SMT, and the control group did not receive any treatment intervention. The perceived EFI by examiners was 60% after spinal manipulation, in contrast with 37% response in the untreated control group. The difference in proportions was statistically significant (P = .04). Thus, the purpose of this study was to investigate the responsiveness of end-feel to SMT in the cervical spine, where different examiners performed the palpation and a different patient population was used. This was the second randomized trial to evaluate the responsiveness of motion palpation and the first to be conducted on the cervical spine. In this context, the results indicated that end-feel assessment was a useful tool for monitoring clinical progress in terms of improvement or lack thereof noted in fixation(s) found before treatment. Therefore, in this context and in terms of Yeomans'  recommendation for establishing clinical progress tools, these results would indicate that end-feel assessment could be used as one of these tools. Results showed that the sensitivity was excellent (93%) and the specificity was adequate (67%). The test performed well, with much of the positive findings attributable to the palpation exam itself (etiologic fraction = 64%). For symptomatic participants in this study, a strong relationship existed between receiving SMT and EFI. This shows that a blinded end-feel examiner's putative EFI was greater in those participants that received SMT (9 of 10), and lesser in those participants that did not receive SMT (2 of 10). This was in contrast to the findings for asymptomatic participants, where low specificity (large false-positive test rate) was observed. The tendency to positive tests suggested that it may be more difficult to rule in EFI in an asymptomatic participant population. These results differed from those of Haas et al,  whose overall EFI is 39% for the thoracic spine and the results were comparable for symptomatic and asymptomatic participants. The overall etiologic fraction was 50% greater in this cervical study, twice the magnitude for symptomatic participants, and comparable for asymptomatic participants. A possible explanation for the perceived improvement in the end-feel of the motion segment in the asymptomatic population, regardless of whether they received SMT or placebo, could be that the fixations found before treatment may have been classified as a minor or muscular-type of fixations (as described in Schafer and Faye ), and therefore, these muscular fixations might have been difficult to palpate both pre-and postintervention. This suggestion was supported in this study, where it appeared that the fixations might have been more difficult to identify with motion palpation in the asymptomatic population. This would have compounded the motion palpation reassessment for any change in the quality of a fixation that was difficult to palpate at the outset. Another possibility is that the restrictions in symptomatic participants were more obvious and therefore may have led to enhanced performance in both identifying the restriction, as well as in identifying restriction changes. Therefore, it might be of benefit to develop a grading system to assess fixations before and after treatment. However, the practical problem with this is that it might be difficult to teach, as every examiner's interpretation of the grade of the fixation might be different. A positive point about developing this grading system is the development of subtlety of perception of motion restriction and its improvement. For the purpose of improving methods to monitor patient progress in one's practice, the skill of assessing change in the motion segment needs to be mastered. 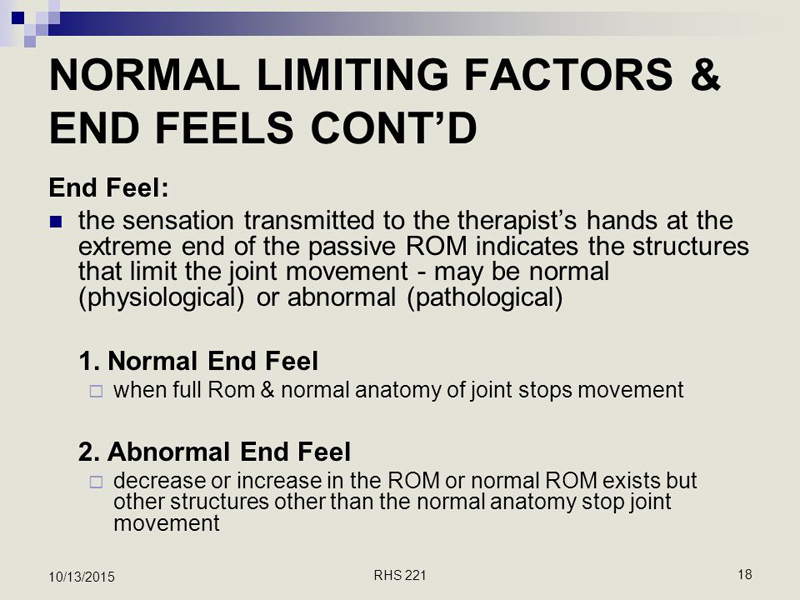 It was reported by DeBoer et al  that in some instances, consecutive vigorous motion palpation on subjects by the 3 examiners in their study sometimes resulted in cavitations occurring within the joints and therefore reported the possibility that the fixations that were previously present within those joints might have been removed at some point during data collection. This is in accordance with the findings of Carmichael  on the sacroiliac joints. They suggested that if the testing procedure was performed repeatedly, mobility within the joint might change. If this was the case, then some in the control group were not genuine unchanged persons, causing underestimation of specificity and the etiologic fraction. If motion restriction was more minor in asymptomatic participants, unanticipated motion restoration could have a greater effect on specificity and etiologic fraction for asymptomatic participants. Another scenario is that SMT may not have led to true EFI after SMT in all cases, resulting in either an overestimation or underestimation of the EFI. Therefore, 3 variables are needed to be considered in affecting the EFI and therefore altering sensitivity and etiologic fraction. The first is cavitation, which is believed to increase motion,32 but it often occurs at vertebral motion segments other than the target segment. Second, treatment may also simply fail. Third, cavitation may not be required to engender patient change34 so the impact of cavitation may not be important. This study excluded the use of subjective outcome measures of pain and functional disability. It might be of interest to include these in future studies of the same nature to assess the relationship between symptomatic improvement and EFI. This might allow a comparison between the subjective response of the patient and the response as determined by the clinician. Cervical motion palpation of EFI appears to be a responsive postmanipulation assessment tool for determining whether perceived motion restriction found before treatment improves after SMT. This observation may be limited to symptomatic participants, as in many asymptomatic participants, the EFI occurred despite the type of treatment received. The authors thank the Chiropractic Department and Centre of Research Management and Development at their institution for their valuable support. This study was submitted as part of a dissertation to the Faculty of Health, in partial compliance with the requirements for a Master's Degree in Technology: Chiropractic, at Durban University of Technology, Durban, South Africa. Lewit, K and Liebenson, C.
The reliability of lumbar motion palpation. St. Louis: Mosby year book; 1995. p. 61-2, 150-5. Gillet, H and Liekens, M.
A further study of spinal fixations. in: The chiropractic theories: a textbook of scientific research. 4th ed. Bergmann TF, Peterson, Lawrence DJ. New York: Churchill Livingstone, Inc. 1993: 87-97, 125, 133.
in: The fundamentals of palpation. 3rd ed. in: The clinical application of outcomes assessment. Haas, M, Panzer, D, Peterson, D, and Raphael, R.
a randomized controlled trial of construct validity. in: Motion palpation of the spine. Mootz, RD, Keating, JC, Kontz, HP, Milus, TB, and Jacobs, GE. Intra- and interobserver reliability of passive motion palpation of the lumbar spine. Keating, JC, Bergmann, TF, Jacobs, GE, Finer, BA, and Larson, K.
Interexaminer reliability of eight evaluative dimensions of lumbar segmental abnormality. Haas, M, Raphael, R, Panzer, D, and Peterson, D.
Reliability of manual end-play palpation of the thoracic spine. DeBoer, K, Harmon, R, Tuttle, CD, and Wallace, H.
Reliability study of detection of somatic dysfunctions in the cervical spine. Nansel, DD, Peneff, AL, Jansen, RD, and Cooperstein, R.
Mior, SA and King, R.
Intra and interexaminer reliability of motion palpation in the cervical spine. Van Trijffel, E, Anderegg, Q, Bossuyt, PMM, and Lucas, C.
Haneline, MT, Cooperstain, R, Young, M, and Birkeland, K.
Stochkendahl, MJ, Christensen, HW, Hartvigsen, J et al. Manual examination of the spine. A systematic, critical literature review of reproducibility. On the subject of human subjects. Principles and practice of chiropractic. 2nd ed. Stanford: Appleton and Lange; 1992: 305-18, 557-72.
in: Chiropractic management of spine related disorders. Peterson, DH and Bergmann, TF. The spine: anatomy, biomechanics, assessment, and adjustive techniques. Schafer, RC and Faye, LJ. Application of health status measures. in: C Jenkinson (Ed.) Measuring health and medical outcomes. in: Clinically orientated anatomy. 3rd ed. Cramer, GD and Darby, SA. in: Basic clinical anatomy of the spine, spinal cord and ANS. Unsworth, A, Dowson, D, and Wright, V.
Ross, JK, Bereznick, DE, and McGill, SM. is spinal manipulation accurate and specific? Flynn, TW, Fritz, JM, Wainner, RS, and Whitman, JM. in individuals with low back pain.